Viera Regional Park — located just North of The Avenue. The serene location provides us with enough space to work hard. There are soccer fields, basketball courts, plenty of running space, and TWO playgrounds – the perfect space for SLAM fun! We meet near the first playground area within the park. When you enter Viera Regional Park take your first right into the parking lot. Drive towards the sidewalk that leads to the concession/restroom facility located between the football fields & soccer fields. We warm up in this general location. Can’t wait to SLAM with you soon! Message us via social media if you have any questions on our start location. Katrina is a proud Air Force spouse, mother of a beautiful little girl and currently pregnant with a baby boy! 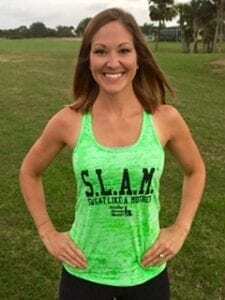 She has a bachelor’s degree from Iowa State University and is an ACE certified group fitness instructor. She is certified through the American Red Cross in adult and pediatric First Aid/CPR/AED. She holds three Perinatal Fitness Certifications as well as a Sports Conditioning Specialty Certification. Katrina grew up on a farm in rural Iowa and now lives in the Space Coast of Florida with her husband Daniel, daughter Dahlia and three dogs. After instantly falling in love with S.L.A.M. through the first Virtual Get Fit program, Katrina recognized the opportunity to bring Stroller Strong Moms to her community. Katrina’s favorite way to sweat like a mother is through Tabata workouts, sprinting, weight training, any circuit with burpees and—you name it, she LOVES it! Because you don’t have to do much to sweat like a mother in Florida! Katrina is ecstatic to bring Stroller Strong Moms; a village of determined women challenging and encouraging one another to the Space Coast. Keep Up With SLAM'n Space Coast! Join SLAM Space Coast on Instagram! Contact the SLAM Space Coast Team! This group is SO MUCH MORE than simply a workout group! Katrina does an incredible job of creating a true community, and the women are positive, encouraging, and welcoming. I love that the workouts allow you to tailor the exercises to your specific fitness level, making it accessible to everyone. I always walk away feeling strong and with a big smile on my face thanks to these awesome ladies! Before coming the first time, I was worried that my kiddos wouldn’t be patient enough to sit in a stroller for that length of time, but they actually do great because we move around the park and they get to interact with the other kids and watch their mama work hard. Give it a try and see for yourself! Jessica is a proud Air Force spouse and enjoys living on Florida’s Space Coast with her husband Nate and their children Reese, Finn, Sage, and Remi. 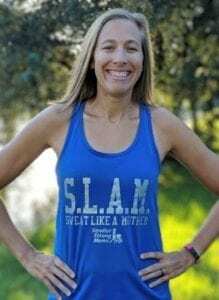 She has a bachelor’s degree from Brigham Young University Utah and is an ACE certified group fitness instructor with a CPR/AED certification through AHA. Jessica grew up loving sports and played both soccer and basketball competitively. She became a member of Stroller Strong Moms Space Coast at the grand opening in 2018 and loves being part of an amazing group of strong, motivated women! Her favorite ways to sweat like a mother include weight training, sports/theme classes, and a little bit of friendly competition. I love this group! It has helped me gain my strength not only physically but mentally as well. I look forward to going every day to see what our instructor has come up with! She is so creative and inspiring. She helps with the kids to make sure us mamas get our workout in! I’ve been able to make other mama friends and also my kids love going and playing with all the other kids! I love my SLAMily! I found out about this group through FB and it couldn’t have been better timing. I’m so happy that I went out and gave it a try. This is such a great class for me AND my kids! It gets us out of the house, I get a great workout in, and my kids get so much social interaction. It’s great to be surrounded by other moms on a regular basis and the coach is even super helpful with my littlest one so I don’t miss a workout!